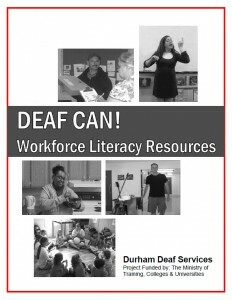 The Deaf Can! Workforce Adult Literacy Resource is meant to be used as a Teacher’s Resource. Some activities may require instructor assistance. The target group for this project is Deaf adults at an LBS literacy level of 2 or 3. The main focus of these activities is on developing skills in Reading Text, Numeracy, and Document Use. As you work through the activities, however, you will notice other skills being used such as writing, communication, working with others, computer use, and thinking skills. The purpose of this project is to provide authentic literacy based tasks found at a variety of entry level jobs, including: ASL Instructor, Assembly Work, Cleaner, Counselor, Courier, Kitchen Helper, Landscaper, Laundry Worker, Shipper/Receiver, and Store Stock Clerk. Many of the skills used here are readily transferable to other workplace environments.